You can earn Mango vouchers using a Nedbank credit card (the most with their American Express card). A rule of thumb is that if you're spending less than R31,000 a month on your credit card, you're better off with a Kulula credit card than a Nedbank American Express card. There's 3 main reasons to apply for a Kulula credit card: (1) Moolah, (2) extra baggage allowance & (3) more exposure to the famous Kulula humour. Here's some easy facts - when spending by using the Kulula credit card you earn "Kulula moolah", a pseudocurrency which can be used to purchase Kulula flights (for yourself or others). When you purchase Kulula flights with your Kulula credit card you earn a bonus amount of Kulula moolah equivalent to 3% of the cost of the flights. Kulula moolah expires after six months (i.e. the moolah you earn in January expires in June). You also get 5kg extra baggage allowance, allowing you 1 piece at 25kg. It's pretty easy to understand the value of Kulula moolah, as each R1 of Kulula moolah allows a R1 discount on a Kulula flight. To secure really cheap flights combine your moolah with Kulula specials. 9 May 2013. Kulula introduces a gold credit card. 27 Aug 2008. Kulula announces that it has issued 20,000 Kulula credit cards. 3 Mar 2008. Using Billads' services, Kulula starts advertising its credit card on the inside of bill folders. Sep 2007. A Gold Loerie is won for Kulula's credit card advertising campaign. 26 Aug 2007. Kulula unveils its credit card. 18 Aug 2007. Television advertisement for the launch of the Kulula credit card. registration number 1929/001225/06) and the other partner is Visa. To qualify for a Kulula credit card, you need to be at least 21 years old and earning at least a minimum amount a month. The information on this webpage may be out of date - to get up to date information go to the Kulula website. Some of Kulula's credit card terminology is quite complex. We wrote to them to help us decipher it, and here's a list of Kulula credit card terminology explained. Kulula credit card competition - spend R10,000 and stand the chance of winning R15,000. 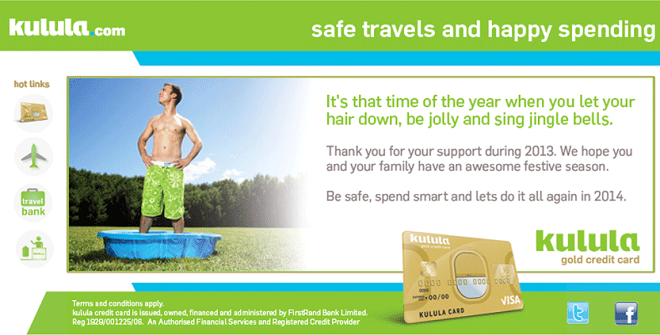 As part of its 7th birthday celebrations, Kulula offers R147 in Kulula moolah to its credit card holders. Roll on Kulula free flight - my first Kulula Jetsetter statement indicates that I've earned R309 worth of Kulula moolah. My Kulula PIN number has arrived. I earned my first R200 Kulula moolah. My Kulula credit card arrives. Applying for a Kulula credit card.